You Won't Believe What Malaika Arora Khan Did After Seeing Salman Khan At A Party! You Won’t Believe What Malaika Arora Khan Did After Seeing Salman Khan At A Party! Salman Khan was recently in the news for his temperament and seasonal mood swings. Yes! like always, Salman was seen miffed at the media and this time it was for snapping his pictures with Iulia Vantur at Deanne Pandey‘s birthday bash. Reports tell that, when Salman entered the residence with rumored girlfriend Iulia Vantur, the paparazzi snapped his pictures leaving him annoyed and asking to leave as it’s time to go home after work. Well! that is not new when it comes to having news about Salman. 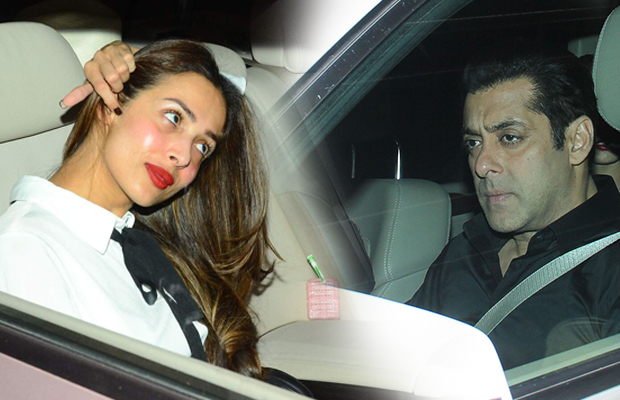 What’s interesting here is that Salman‘s sister-in-law Malaika Arora Khan was seen leaving the party after she heard about Salman Khan attending the party. Well! This is mainly because of the tensions that are taking place in Arbaaz Khan‘s life after his on- going divorce proceedings. It is said that Salman Khan is very disappointed by Arbaaz and Malaika‘s marital status and seems to have no interest keeping relations with Malaika Arora Khan. This awkwardness probably left no choice for Malaika than leaving the party and going off. Salman Khan, last seen in Sultan is currently hosting Bigg Boss and will be seen in Kabir Khan‘s Ek Tha Tiger‘s sequel, Tiger Zinda Hai soon. Also Watch Video: Arbaaz Khan Malaika Arora Khan Split, Guess What Happened When Salman Khan Met Malaika! Previous articleExclusive Bigg Boss 10: Manu And Manveer Offer Non-Veg Food To Om Swami, You Won’t Believe What He Did Next! Next articleBigg Boss 10: Post Eviction, Here’s How Jason Shah React!